Beige Suits are available in several stunning designs and styles and at various price levels. These suits are of excellent quality made by reputed houses specializing in making quality suits. You can get Beige suits made from the finest Merino worsted wool if you can afford and be willing to pay the price for them. For people with rich taste, there are the fabulous men's Italian beige suits with 3 buttons made from quality fabric, 3 piece vested suits made from 120's wool and 1 button notch lapel tan/beige suit, made from super 130's soft light wool. There are beige suits also available at competitive prices like 3 buttons suit made with Italian super 150's wool and 4 or 5 button taupe/beige suit made from super 100's wool. Those with slightly different taste can opt for beige pinstripe suits with 3 buttons or beige color suit with 4 or 5 flat front buttons. 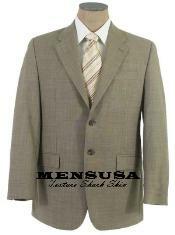 The beige/tan colored business suits will be an ideal choice for official meetings and business conferences. Before finally making your buying decision, do not fail to look at some elegant ones like the 3 piece beige vested suits and the 4 button notch shark skin beige suits and the 3 button luxury beige pinstripe suit. Beige suits are the in-thing today and if you are fashion-conscious and want to look trendy, then order your beige suits right away.